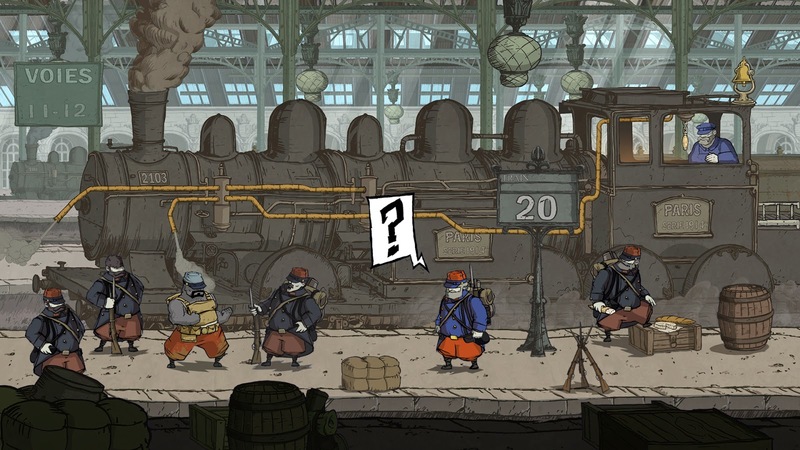 I use Steam fairly sporadically and probably only own about half a dozen games on it, all of them fantasy RPGs, so when it recommended a little game to me called "Valiant Hearts: The Great War / Soldats Inconnus Memoires de la Grande Guerre" I began to wonder if there was a tiny psychic living inside the magical box in my living room. "How could you know that I'm a history buff with a particular interest in the World Wars?" 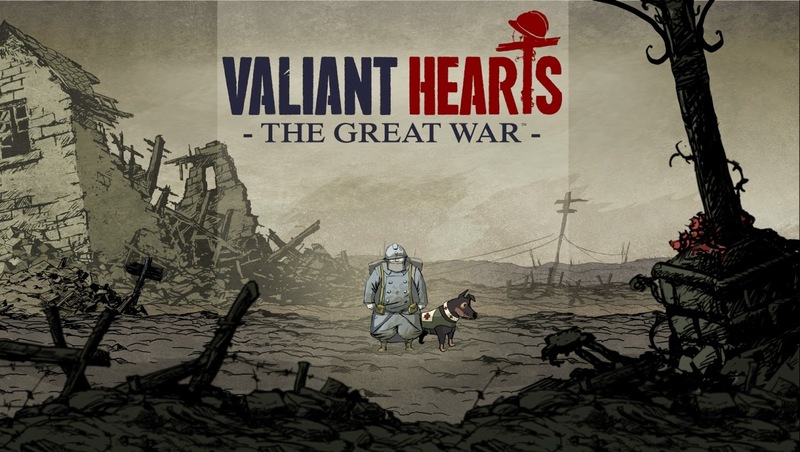 thought I.
Valiant Hearts is a side-scrolling comic book style adventure set in World War I. At first I worried that this almost light-hearted portrayal would fail to do the setting justice. I soon learned that this "softer" style of art was probably the only way they could convey the story without reducing would be players to tear-soaked wreckage. Karl: A German citizen living in France with his wife, a French citizen, named Marie, and his father-in-law, Emile. Karl is deported to Germany after hostilities break out between Germany and Russia following the assassination of Archduke Franz Ferdinand. Emile: Karl's father-in-law. Emile is drafted to join the French armed forces after France joins the war against Germany. Freddy: An American citizen and member of the French foreign legion. Freddy enlists to fight and get revenge, apparently to avenge the death of his French amour at the hands of the German officer, Baron Von Dorf. The Mutt: This furry guy may not have much to say, but he's a staunch companion who will accompany Emile throughout the game. Anna: Anna is a veterinarian training in Paris when her father, a Belgian scientist, is forcibly "recruited" by Baron Von Dorf. Anna volunteers as a taxi driver transporting French troops to the front lines in hopes of locating and rescuing her father. The story, as one might imagine, is intense, and the art, though simplistic and almost cutesie, conveys the horror and death surrounding this emotionally charged story in a way that is both respectful and bearable. 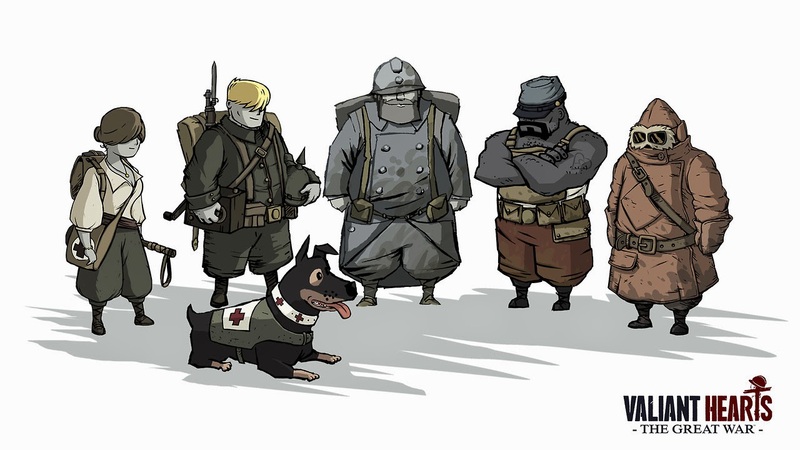 The gameplay is interspersed with heart-wrenching memos, black and white photos of the war, and various journal entries giving greater information and background on the various battlefields and events our heroes find themselves caught up in. I've only completed the first chapter of this game so far, but I've already laughed, cried, and been reminded of a time in our history when tragedy and heroism were rampant, often marching hand in hand. As games go, I consider that a roaring success.